Coach Jon Gruden expects Carr to improve with more experience in the same offensive system, getting an additional boost from the offseason additions of wide receivers Antonio Brown and Tyrell Williams, Scott Bair of NBC Sports Bay Area reports. General manager Mike Mayock said Wednesday that he views Carr as a franchise quarterback, Vic Tafur of The Athletic reports. Coach Jon Gruden suggested Carr will return as the Raiders' starting quarterback in 2019, Jerry McDonald of The San Jose Mercury News reports. "Look, you throw for 4,000 yards in the NFL with what [Carr]'s been through, it's quite a year, quite a year indeed," Gruden said Sunday. "A new system, young tackles, inside three guards are all gone, receivers are coming and going. A new feature back. He did some really good things to build upon. We need to get better around him and I've got to get better myself." 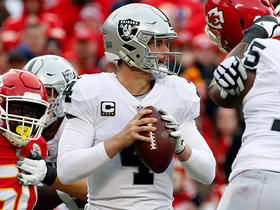 Carr completed 24 of 33 pass attempts for 185 yards and two interceptions in Sunday's 35-3 loss to the Chiefs. 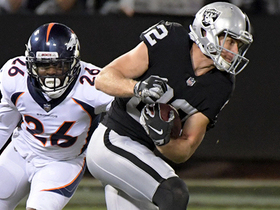 Carr completed 19 of 26 attempts for 167 yards during Monday's 27-14 win against Denver. Carr completed 21 of 38 pass attempts for 263 yards and one touchdown Sunday against the Bengals. He also lost a fumble in the 30-16 loss. Analysis: Carr completed just 55 percent of his passes and averaged a lackluster 6.9 yards per attempt. He salvaged his day with a few big pays downfield and a one-yard touchdown pass to Lee Smith in the second quarter. Carr was coming off back-to-back games with at least 285 yards and multiple touchdowns, so it's a bit disappointing he wasn't able to keep it rolling in a favorable matchup. He'll look to bounce back next Monday night against the Broncos. Carr completed 25 of 34 passes for 322 yards with two touchdowns and no interceptions in the Raiders' 24-21 win over the Steelers on Sunday. He also lost a yard on his one carry and lost a fumble. 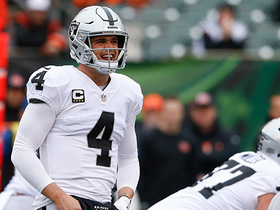 Carr completed 29 of 38 passes for 285 yards and three touchdowns during Sunday's 40-33 loss to the Chiefs. He also ran for eight yards on his lone carry. Carr completed 16 of 34 passes for 194 yards and a touchdown during Sunday's 34-17 loss to Baltimore. He lost a fumble that was returned for a touchdown and there was some brief concern that he had suffered a concussion during the contest, Paul Guitierrez of ESPN reports. Carr completed 19 of 31 attempts for 192 yards and two touchdowns during Sunday's 23-21 win against Arizona. 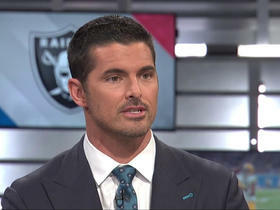 Carr completed 24 of 37 passing attempts for 243 yards in Sunday's 20-6 loss to the Chargers. Carr completed 16 of 22 passes for 171 yards with no touchdowns or interceptions in the Raiders' 34-3 loss to the 49ers on Thursday. He also rushed three times for five yards before being pulled early in the fourth quarter. 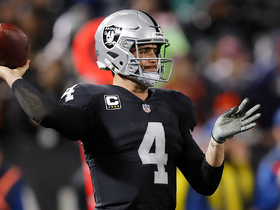 NFL Network's David Carr reveals that the Oakland Raiders kept his brother, quarterback Derek Carr, in the loop about free agents they planned to target this offseason. 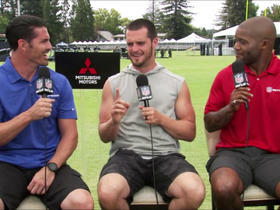 Oakland Raiders QB Derek Carr explains what wide receiver Jordy Nelson has brought to the team both on and off the field. 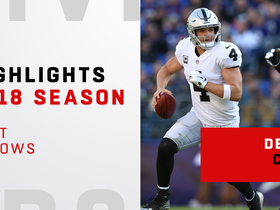 Watch Oakland Raiders quarterback Derek Carr's best throws in the 2018 season. 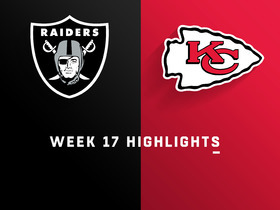 Watch the best plays from the Week 17 matchup between the Oakland Raiders and Kansas City Chiefs. 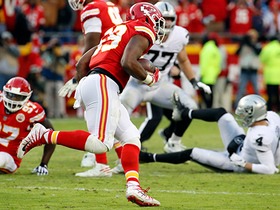 Kansas City Chiefs linebacker Reggie Ragland intercepts Oakland Raiders quarterback Derek Carr and returns the interception 67 yards. Kansas City Chiefs linebacker Justin Houston strip-sacks Oakland Raiders quarterback Derek Carr and hops on the fumble recovery for the Chiefs. Oakland Raiders quarterback passes 12 yards to wide receiver Jordy Nelson. Oakland Raiders quarterback Derek Carr completes the pass in tight coverage to wide receiver Jordy Nelson for a 16-yard gain against the Denver Broncos. 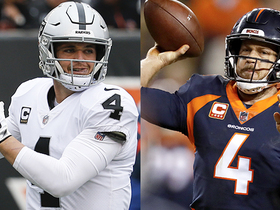 NFL Network's Marcas Grant and Adam Rank offer some projections for the top players in the Week 16 game between the Denver Broncos and Oakland Raiders. 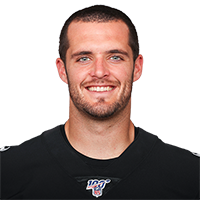 Listen to Oakland Raiders quarterback Derek Carr's creative audibles against the Cincinnati Bengals in Week 15.